This Italian dessert is a perfect ending to your seder. It’s a refreshing parve twist on a traditional dairy dessert. 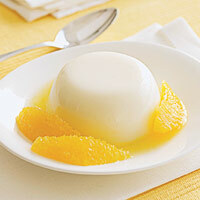 Panna Cotta literally means “cooked cream”. It is actually not cooked beyond being heated, and is a light, flavorful imitation of a baked custard. Cut the vanilla bean lengthwise, scrape out the inside, and save the outside of the bean. Peel the skin of a lemon, and 2 oranges, try not to include too much of the white pith. To infuse the citrus flavor into the whipped topping, combine in a pot; the 6 cups of parve whipped topping, vanilla bean scraped inside as well as outside pieces, lemon peel and orange peel. Then sprinkle the gelatin on top of the mixture, let it sit for 5 minutes. Then put the pot on a low flame, not allowing it to boil, just to simmer. After you turn on the flame add the sugar and stir the mixture, until it’s combined. Let it simmer for 20 minutes, stirring occasionally. Take it off of the flame and strain it into a bowl. This will allow for the peels to separate from the mixture. Pour a little oil onto a paper towel and lightly grease the inside of the foil cup. Pour strained mixture into the cups, a little less than the top of the rim. The cups can be placed on a baking sheet and then refrigerate them to set for 4 hours or overnight. After they have set you can cover them with saran wrap. Can be made up to a week in advance. Will keep up to 2 weeks in the fridge. Put the egg yolks in a metal or glass bowl. In a medium sized pot combine the pareve whipped topping, orange juice, vanilla bean; scraped inside and outside, sugar and orange peel. Bring the mixture to a boiling point, turn off flame and pour the hot mixture from the pot slowly into the bowl with the egg yolks. As you are pouring the mixture you must continuously stir the egg yolks with a whisk. Once the mixture has been combined with the egg yolk continue to whisk until completely blended. Return the mixture to the pot and bring it to boil while continuously stirring. The mixture will thicken in about 3-4 minutes, then remove from heat, and strain the mixture into a bowl. Let it cool. Serving Suggestions: Take a sharp knife and go around the inside edges of the cup to separate the Panna Cotta from the cup, Then flip it upside down onto your dessert plate. You can also poke a hole in the bottom of the cup to help it slide onto the plate. The take a spoon and put the Creme Anglaise around the Panna Cotta. Garnish with an orange slice. Ehud Ezra is one of the finest pastry chefs. While I have not tried this, I trust anything from his repertoire for our guests.